Microtubules function as small, interconnected tubes of polymers that form part of the cytoskeleton in eukaryotic cells and some prokaryotic cells. Microtubules are versatile cellular structures that serve many functions. One primary function of the microtubules is to give the cell its shape and structure, much like how skeletons in humans give the body shape and structure. Another main function of microtubules is to assist in intercellular transport. Microtubules constitute clearly defined paths for the movement of cellular resources, and so they function like the highways of the cell; roads that connect the different areas to each other and provide a means to travel from one area to another. The microtubules, along with the microfilaments, form the cell’s cytoskeleton. 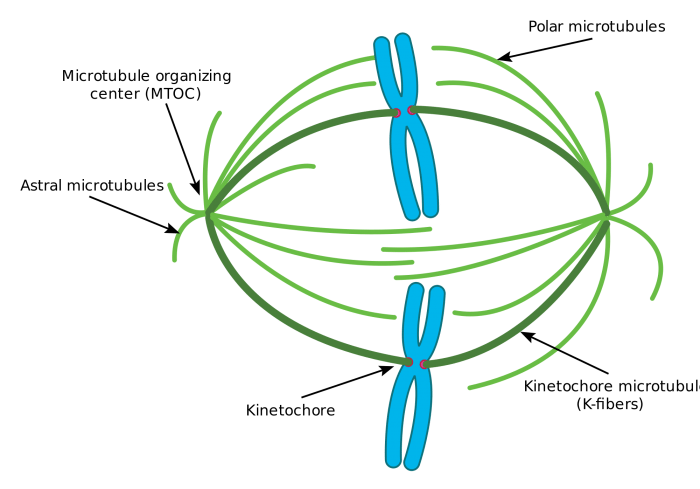 Microtubules also play a role in meiosis and mitosis as they are the primary constituents of the mechanism that pulls chromosomes apart for cell division. Microtubules were first discovered in 1964 by American and Canadian-American biologists Myron Ledbetter and Keith Porter. In a famous and widely circulated article, Ledbetter and Porter described the observation of fiber-like structures of 25nm in diameter in plant cells. Ledbetter and Porter immediately determined that the had discovered a new organelle, and they correctly postulated that the microtubules were the same structure found in mitotic spindles. Subsequent work has shed light on the microtubules’ role in a number of processes such as cell movement, construction of cilia and flagella, embryonic development, and gene expression. 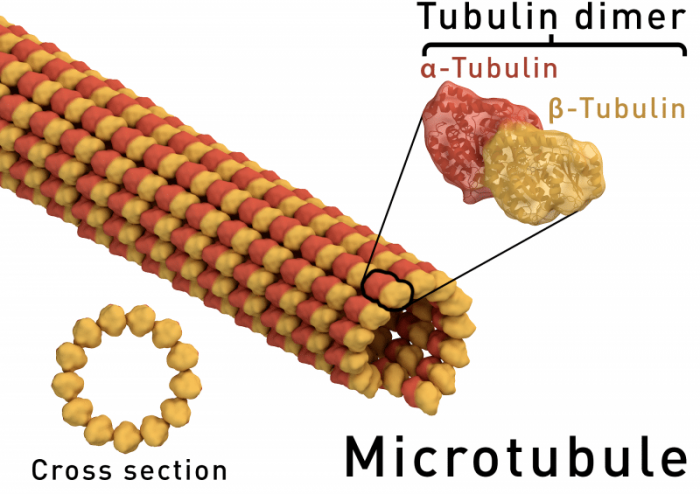 Microtubules are hollow cylindrical structures composed out of two types of proteins, α- and β-tubulin. α- and β-tubulin dimers connect to for long chains of polymers that then stack on each other to form the tube. The inside of the tube is referred to as the lumen. Microtubules have an electric polarity that is essential for their functioning. When microtubules form, the α- and β-tubulin in each dimer make contact. Thus, in fully formed microtubules, one end has exposed α-tubulin and the other end has exposed β-tubulin, identified as the (−) and (+) ends, respectively. The polarity in each microtubule affects how the aggregate, forming a pseudo-helix structure Each ‘ring’ of the helical structure consists of approximately 13 dimers. The molecular structure of microtubules. α- and β-tubulin aggregate to form the polarized cylinders. Source: WikiCommons. Animal cells are unique in that they contain special organelles for the construction and maintenance of microtubules, organelles known as centrioles. Two or more centrioles will aggregate perpendicularly to each other. Essentially, the two aggregated centrioles act as anchors for the rest of the cell’s microtubule structure. The centrioles are located near the center of the cell and the attached microtubules radiate outward, with the (+) end facing towards the exterior of the cell. Animal cells also contain a special tubulin protein, γ-tubulin that caps off the (−) end of the structure and serves to anchor microtubules to the centrioles. Plant cells, on the other hand, lack centrioles and rely on other methods to organize their microtubules. Some plant cells, for example, will use the nuclear envelope to anchor microtubules. Since plant cells have relatively thick cell walls and large central vacuoles that exert turgor pressure, plant cells have less of a need for microtubules to give the cell shape and structure. Microtubules are very dynamically unstable, meaning that they frequently change shape, location, break apart, and are deconstructed. Most microtubules have a half-life of only minutes, and microtubule production is constant. The extremely flexible nature of microtubules makes them essential for cellular reproduction, during which entire networks of microtubules are recreated or rearranged. Interestingly, the cell uses these quick-forming and quick-decaying properties of microtubules to “probe” its 3-dimensional interior. 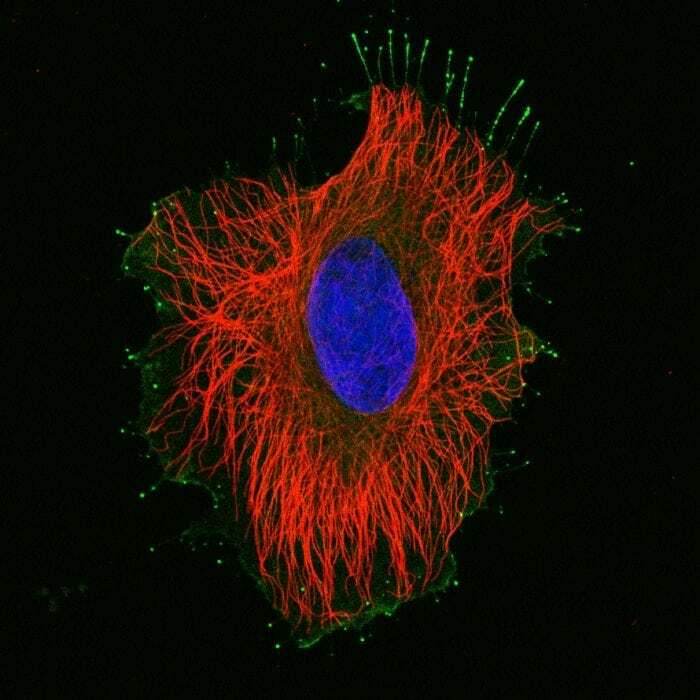 One of the main functions of the microtubules is to facilitate the intercellular transport of resources/waste/secretions. Microtubules facilitate cellular transportation via the activity of motor proteins, proteins that bind to the polymer structure of the microtubule. Motor proteins, such as kinesin, bind to tubulin dimers and to the membrane of a vesicle containing whatever material to be transported. ATP hydrolysis generates energy in the form of mechanical work, which “walks” the motor protein down the microtubules. As a simple analogy, the microtubule is like the train tracks and the motor protein is the cart carrying the goods. The cart follows the train tracks to the desired destination. 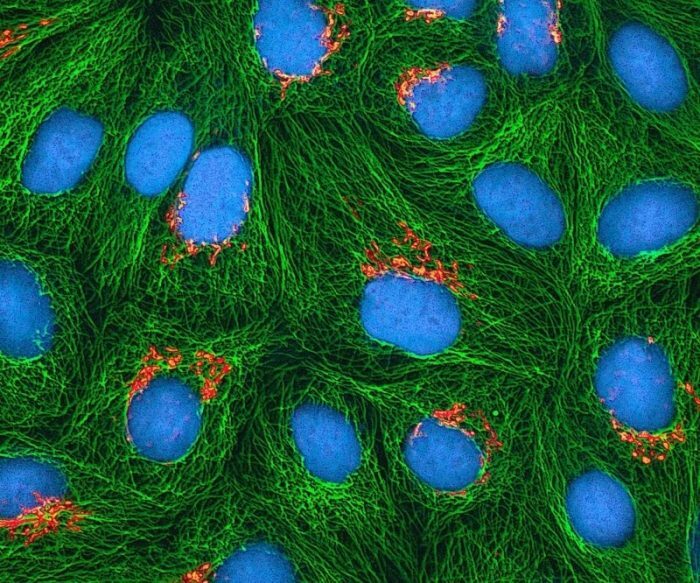 Another major function of microtubules is separating chromosomes during cellular reproduction. During cellular division, a structure known as the mitotic spindle forms from 3 kinds of microtubules, The spindle is essentially a large network of microtubules and other peptides that attach to the chromosomes of the cell. Dynein motor proteins attach to either end of the mitotic spindle and exert mechanical force in the direction of the cell membranes. The generated force pulls the chromosomes apart to create two separate cellular nuclei. The remaining bits of the new cells are then synthesized via cytokinesis. Microtubule degradation is heavily associated with neurodegenerative diseases, such as Alzheimer’s and Parkinson’s. Tau proteins required for microtubule stabilization and maintenance begin to malfunction, and the microtubule structure of neurons begins to degrade. Without microtubule transport, the neurons are unable to get the materials needed for their survival and they die. Current treatments for neurodegenerative tauopathies involve the stimulation of microtubule building blocks, such as α- and β-tubulin to counteract the degradation of microtubule networks. 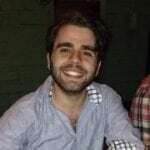 Aside from giving the cell shape and structure, microtubules are also involved in embryonic development by serving as a “scaffold” for developing cells, in the functioning of bacterial flagella as a means of propulsion or locomotion, and there is even evidence that microtubules may play a role in regulating gene expression. All in all, they are a very dynamic part of the human cell, serving many functions at many different levels of organization.